This design is totally groovey and will let the little hippy chick in you shine. 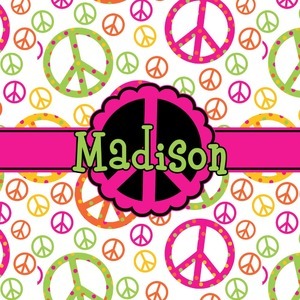 Our peace sign design is simply adorable and has beautiful vibrant colors of pink, orange, lime green and yellow. The larger peace signs have fun polka dots and are surrounded by smaller solid colored peace signs. The design has a classic hot pink ribbon trimmed with black, and the label is a beautiful scalloped peace sign in black and hot pink. Personalize of your choice is done in a beautiful lime green color outlined in black.